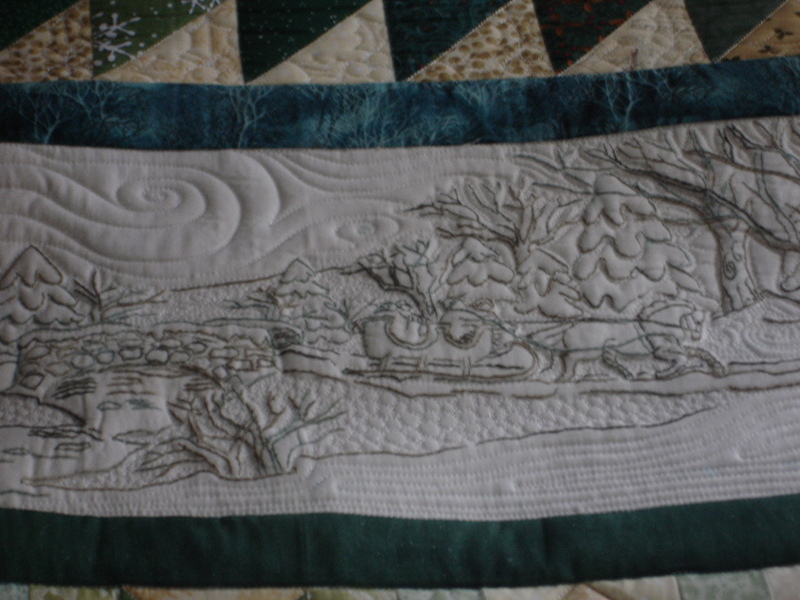 Do you embroider on each block before or after the quilt is made? One long armer said after. I have embroidered each block as I have done them. I still have 6 more to go. Are you using embroidery to quilt the quilt or designs as part of the quilt? As part of the quilt I do it first but using it to quilt the quilt it is done afterwards. I embroidered each block as I did them. The picture didn't show up for me so I don't know what AOTH stands for. I too do not know what AOTH stands for but as a LA quilter who has done several hand ebroidered quilts and one machine embroidered quilt and done a little hand embroidery myself, I embroider when the block is still just a block, not even sewn into the quilt top yet. I can't imagine an embroidery machine handling the bulk of a completed quilt very well while trying to embroider a design but I guess it can be done because many people use digitized machine embroider motifs to do the actual quilting. Sounds to me like the LA quilter who gave you this advice can only do pantos. 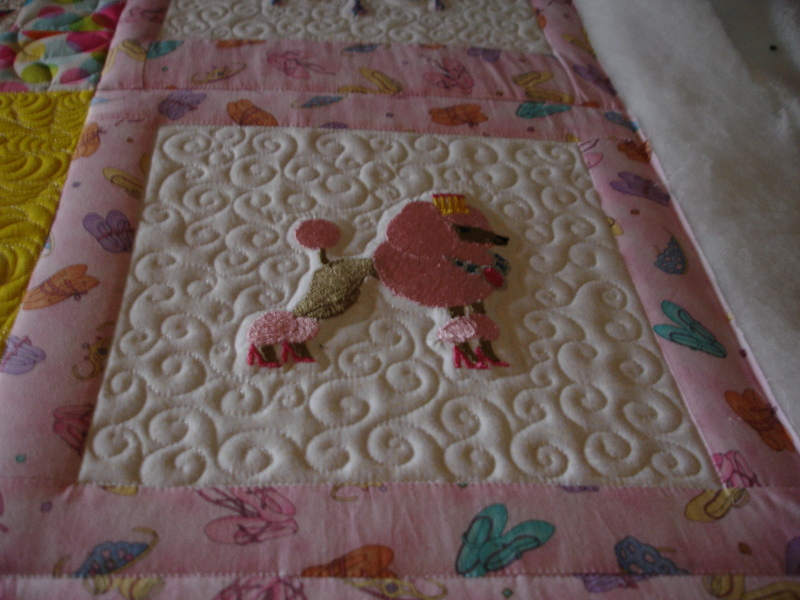 A custom quilting job can avoid the heavily embroidered areas which could cause the LA machine to not be happy going through that heavy bulk. Hand embroidery should also be custom quilted but I have seen many examples that look quite good of quilting going right over the embroidery. (Like a cross hatch) I tend to quilt around it because I want the quilting to be secondary to the embroidery work. 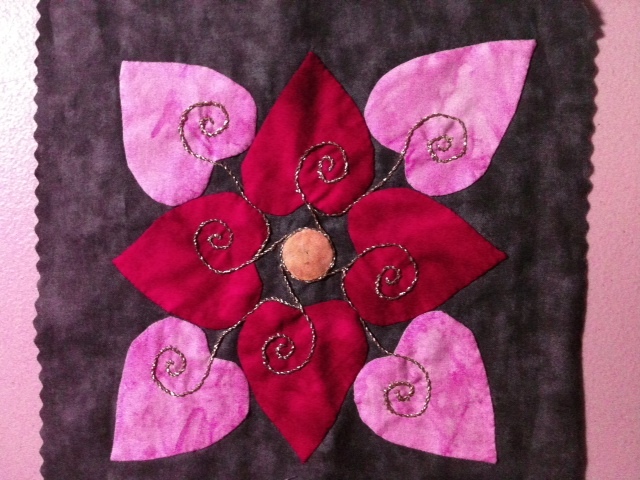 Here are some examples of custom quilting around embroidery. Last edited by feline fanatic; 07-31-2013 at 05:29 AM. I do not know what AOTH stands for. I embroider my blocks first. Here are the two Affairs of the Heart blocks I have done so far. As you can see, the gold thread is hand embroidered. If I ever finish these, I will QAYG each block before joining them together. I believe I enlarged the patterns slightly so that they are 8-1/2" blocks. Ah, thank you Lisa. The embroidery on Affairs of the Heart is mostly stem stitch to do the curly-q vines and such. A well done stem stitch should not interfere with LA quilting, either custom or E2E. And the quilting, if done with a fine enough thread could easily go right over that embroidery and not detract from it. In this case I think it is completely up to the OP. If it were mine I would embroider while the top is still a flimsy (unquilted) because it would be much easier to knot off and look much better on the back if done before quilting. AOTH-Affairs of the heart....of course! I don't know how you could hand embroider after a quilt is quilted. What if she puts quilting where the embroidery is supposed to go? How will you knot your thread? I agree with the others ... I think it would be very difficult to do embroidery after a machine is quilted. Just too darned awkward to work with, let alone how you would tie in or knot off your threads. The good thing is, that you are discussing this with your LAQ. It could be that s/he is not comfortable with working with an embroidered quilt. As FelineF suggested, perhaps she is talking about doing a panto where there would be no control, to avoid the embroidered areas. You've done far too much work in doing an AOTH, so it might be best to look around and find another LAQ'r that can do what needs to be done for you. Be sure to ask to see other similar work that has been done, to make sure that you are going to get what you want ... and not be disappointed, and heartbroken! definitely embroider before quilting- it would be very difficult to embroider the blocks after the quilt is a whole finished quilt. 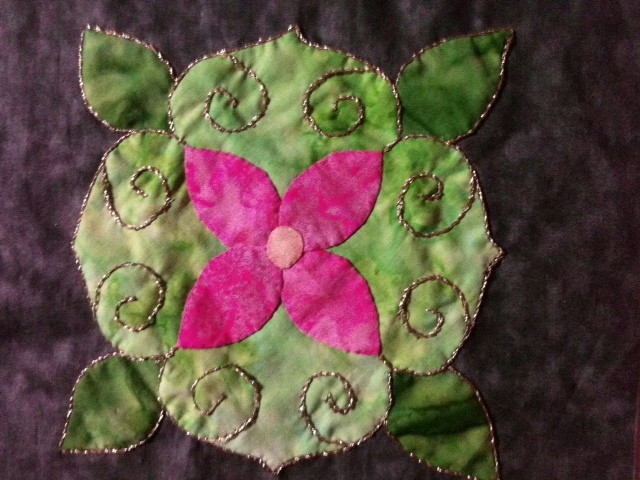 the quilting does not interfere with embroidery- it *should* enhance/work with it. I don't own a long arm, but I always do my embroidery before quilting. As feline fanatic explained it is much easier while the fabric is pliable. I do the same as you. Thanks for the explanation. I have been trying to think of what it might be. Now, I can put my brain back on sleep mode.